When embarking on a building project that encompasses a restoration of an 1816 structure alongside brand-new construction, one may expect a few hiccups, discoveries, and surprises. The process of constructing THNOC’s new exhibition center at 520 Royal Street yielded all three. Throughout the process, we were amazed at the precision required for building the new Tricentennial Wing, just as we were delighted when a section of wall at the Seignouret-Brulatour Building, shielded from the elements since 1822, was exposed, giving us a look at the structure’s original ochre color. To quote our President and CEO Priscilla Lawrence, “we were determined to both bring back and add to the historic structure and its layered history for locals and visitors alike to enjoy.” Almost 15 years after this project was born, check out some of the highlights from the process below. An early shot of the construction for the Tricentennial Wing shows the building’s footprint surrounded by other structures. Construction projects in the French Quarter aren’t easy, but erecting an entirely new building in the middle of a French Quarter block is a feat of planning and careful execution. Barry Siegel, president of Bywater Woodworks, Inc., the contractor that led the effort, acknowledged that building the new Tricentennial Wing was like making a ship in a bottle. 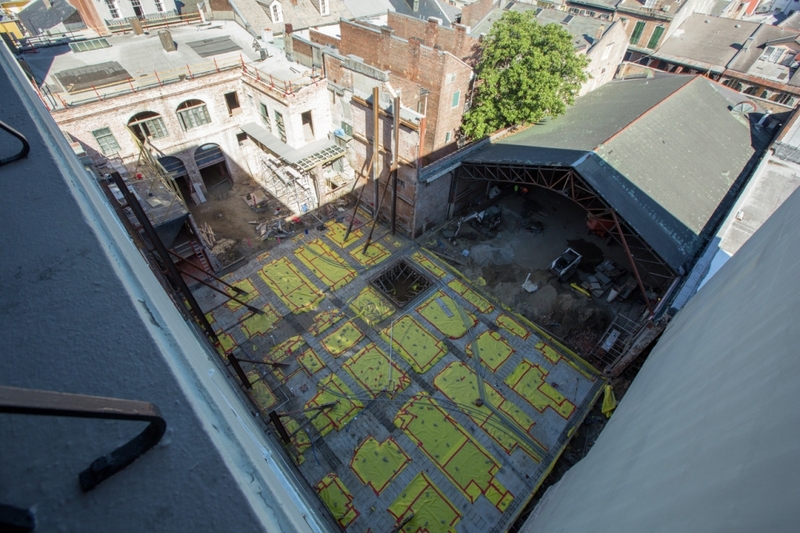 Not only was it hard to fit the new structure into a confined space—the building was constructed with just two inches of leeway from the neighboring Omni Royal Orleans on two sides—it proved difficult even to move the right equipment into the courtyard for the job. “I think we had to let the air out of the tires of the crane so that it could fit through the parking garage,” said Siegel, referring to the preexisting garage adjacent to the Tricentennial Wing. The 200-year-old Seignouret-Brulatour Building was shored to correct significant structural weakness. The building and restoration project consisted of three discrete parts: demolition, structural repair, and build out. Each of these phases makes way for the next, and in the case of demolition, THNOC learned that the historic Seignouret-Brulatour Building and its rear service wings were all in poor shape. THNOC Vice President Daniel Hammer said that over the course of the process every single brick in the historic structure was handled. After crews stripped off the plaster, they started the meticulous process of examining—and replacing, if need be—every brick in the structure. The building was shored and, working on one side of a wall at a time, plaster was removed, the mortar holding the bricks together was chipped out, deteriorated bricks were replaced, new mortar was pointed between the bricks, and then, finally, the walls were covered in breathable, lime-based plaster. To ensure the longevity of the structure, modern, cement-based mortars and plasters employed during past renovations of the building were replaced with natural products, very similar to what would have been used at the time of original construction of the historic buildings. The existing materials retained too much of the moisture the bricks naturally absorb from the ground, ultimately causing many bricks to disintegrate. 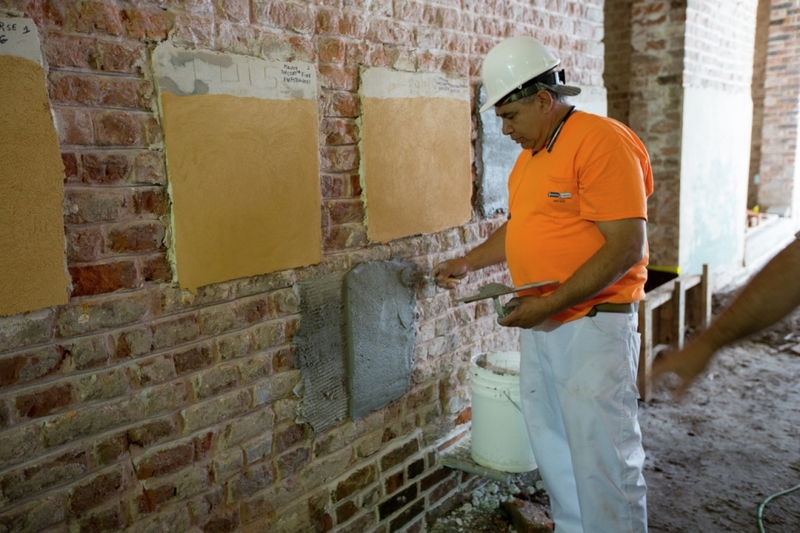 The new, lime-based plaster will allow an easier transfer of moisture to prevent the bricks from crumbling. 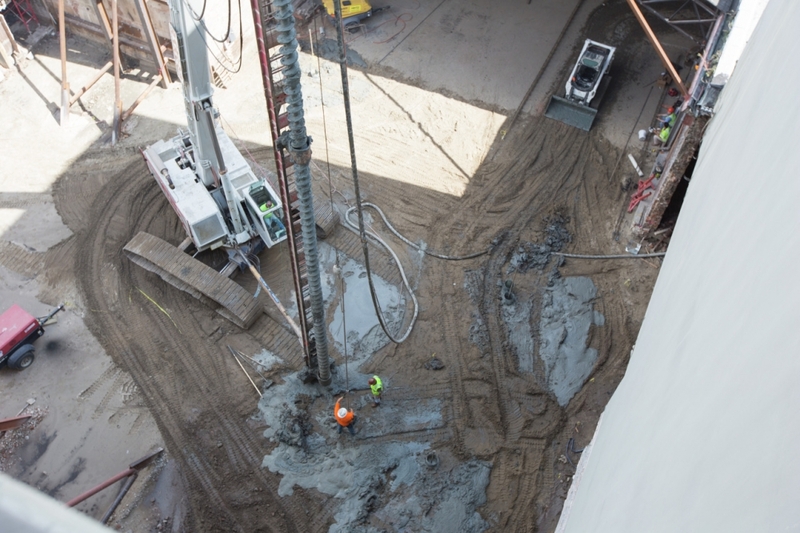 A special auger drove almost 90 feet into the earth to set the concrete pilings for the Tricentennial Wing. Did we mention that building in the French Quarter is a difficult business? The Mississippi River has presented environmental challenges throughout the city’s history—this much we know—so it was only appropriate that a history museum would have to wait on the river’s ebb and flow to begin construction. The pilings for the Tricentennial Wing were drilled 90 feet into the earth, which is deep enough that THNOC had to receive a permit from the U.S. Army Corps of Engineers, which oversees the levee system. This also meant that, in order to begin construction, crews had to wait until the Mississippi River fell to a certain level. Back in January 2016, pile driving for the new construction was delayed for weeks as we (patiently) waited for an unseasonably high river to fall low enough to begin work. An employee from King Company shows swatches of plaster with slightly different pigments at the Seignouret-Brulatour Building. The final color chosen was based off a section of wall that had been covered up since 1822. 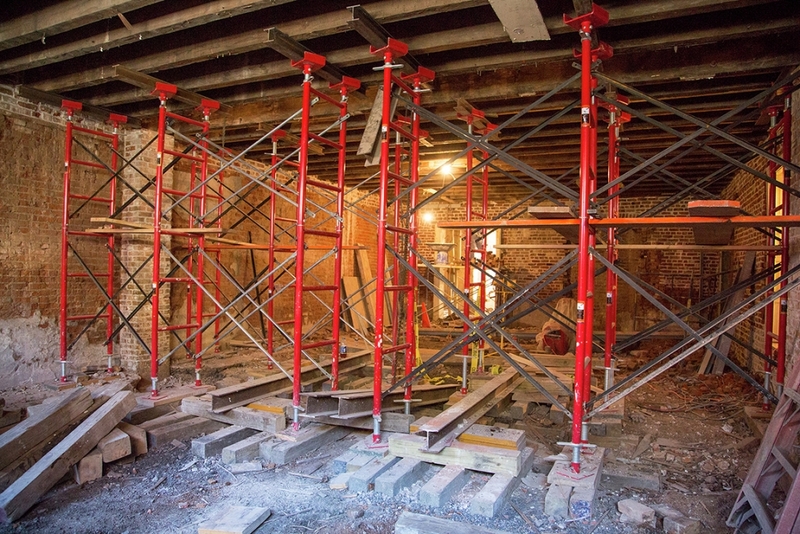 While removing nonhistorical sheetrock from the Seignouret-Brulatour Building, crews noticed that an 1822 addition had separated from the original 1816 structure. While this meant that additional shoring and structural work would be needed, the rift also gave us important insight into the building’s original appearance. A section of wall that had been covered in 1822, only six years after it had been built, revealed the original color of the building—a stunning ochre. Architectural material analysis by Cypress Building Conservation confirmed that this was the original exterior plaster from 1816. Subsequently, the newly discovered, 200-year-old color was added to the plaster for the exterior walls. 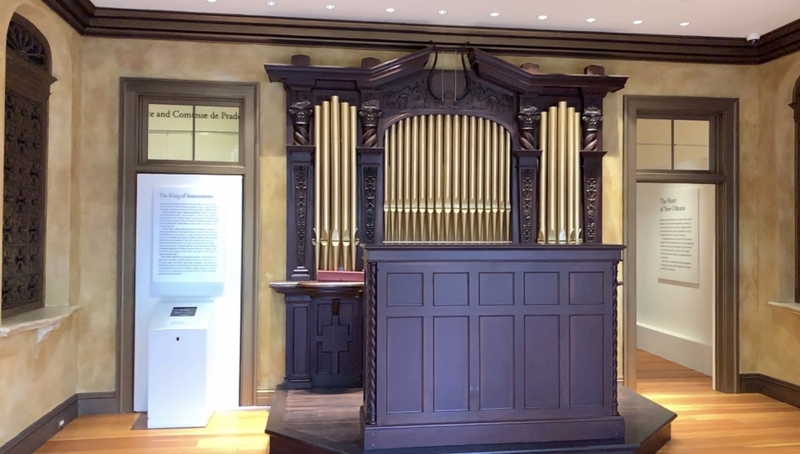 An Aeolian organ installed by William Ratcliffe Irby has been fully restored and will play in the Seignouret-Brulatour Building. One of the most remarkable details of the restoration project was the Aeolian organ, installed by owner William Ratcliffe Irby in 1925. Irby, a tobacco company executive and banker, converted the third floor of the building into a luxurious apartment. In-home pipe organs were the status symbol of the day, and the instruments adorned the homes of tycoons—even Jay Gatsby owned one in The Great Gatsby. Though many of these instruments were systematically stripped and sold over the course of the 20th century, Irby’s is one of the few that has remained mostly intact. The entire organ was sent off for conservation to the Holtkamp Organ Company in Cleveland, Ohio. Fully restored, the instrument is now back in its original home, where it can be played again for generations to come, but despite the appearance that its pipes reside behind the keyboard, the music actually comes from behind three screens positioned around the room. The pipes you are able to see are simply decorative. The Wilson Family Stairway at the Seignouret-Brulatour Building meets the entresol level outside of the Education Galleries. An 19th-century well is preserved beneath a glass covering in the courtyard at THNOC’s new exhibition center. The brickwork below is the floor of the original courtyard. 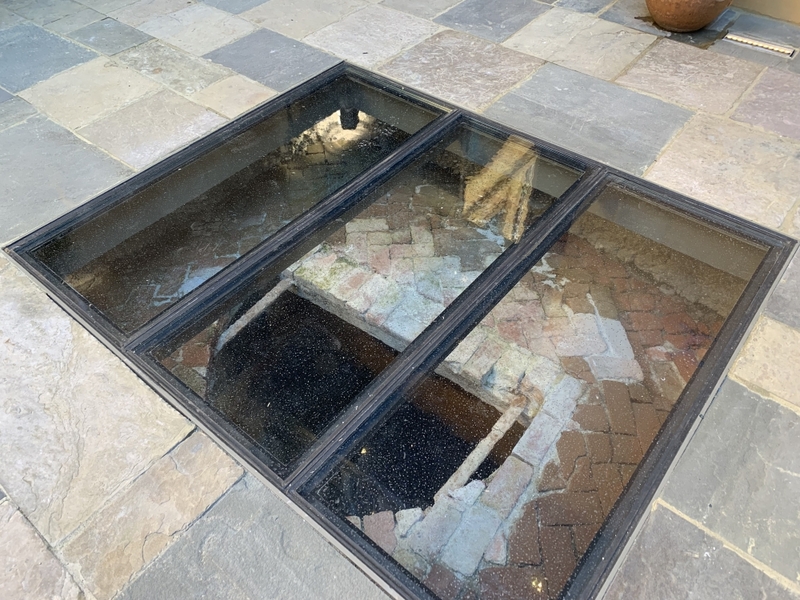 While conducting archaeological work prior to the construction process, THNOC uncovered a 19th-century well that had disappeared beneath the courtyard floor. Now excavated and visible beneath a glass covering, visitors may catch a glimpse of the environmental history of the courtyard. About two feet beneath the glass, at the lip of the well, are the surrounding bricks that once formed the courtyard floor, telling us that over time, the space has sunken considerably beneath what we now consider surface level. Archaeologists from Earth Search, Inc. also extracted discarded objects from the well, most dating from the mid-19th century, which tell stories of the commerce and living conditions in the area. A can of quail meat with truffles, for instance, suggests that the retail spaces fronting Royal Street sold imported delicacies from France. Visitors can view virtual reconstructions of the courtyard over four separate time periods through virtual reality viewfinders that overlook the space from inside the building. The scenes and characters in them are partially informed by material evidence excavated from the property, as well as by extensive archival research conducted primarily by THNOC Curator Howard Margot. 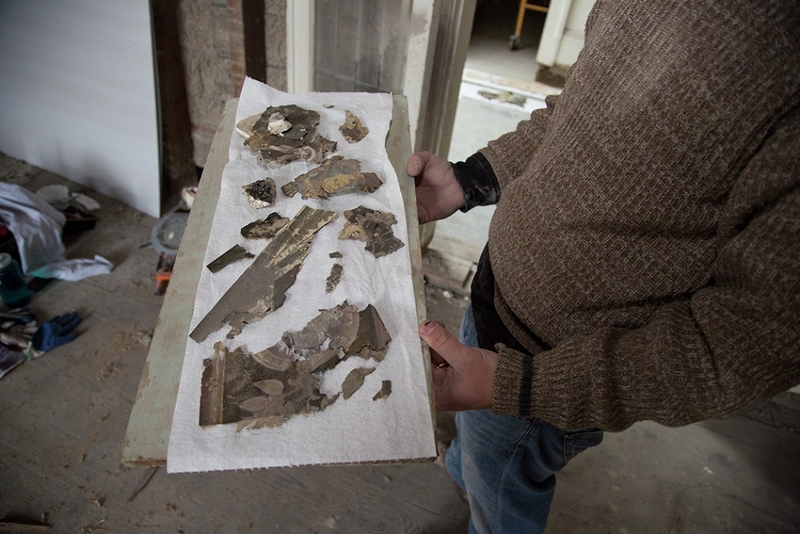 A Cypress Building Conservation employee holds samples of wallpaper removed from the Seignouret-Brulatour Building. Peeling back layers of old wallpaper in the Seignouret-Brulatour Building gave our decorative arts team insight into the literal fabric of the building. Following work by Cypress Building Conservation to extract, separate, and clean each layer of paper, Decorative Arts Curator Lydia Blackmore—with the help of intern Isabel Dissard-Cooper from the Tulane Masters in Preservation Studies program—went to work cataloging and identifying as many of the patterns as she could. “Looking at decorations like wallpaper is really interesting,” said Blackmore. “Each layer tells us about the inhabitants from a different time period, and by identifying style and quality, you can even trace the economic history French Quarter as a whole from its glamorous early days, to the 19th-century tenements, to the 20th-century preservation movement.” Among the samples found were layers of wallpaper installed by the building’s original owner, François Seignouret, including a swatch from fashionable Parisian manufacturer Joseph Dufour and Company. 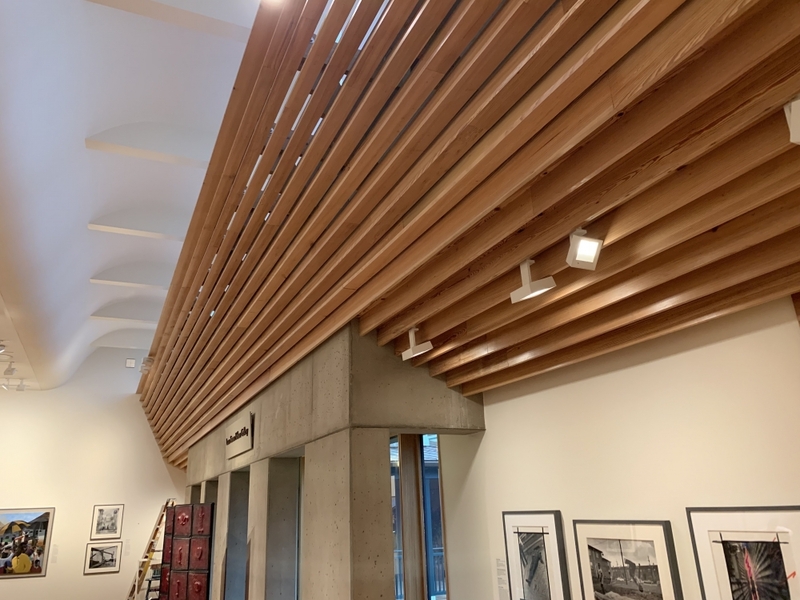 Woodwork adorns the Laura Simon Nelson Gallery in the Tricentennial Wing of THNOC’s new exhibition center at 520 Royal Street. THNOC’s new exhibition center opens to the public on Saturday, April 6, 2019. A grand opening block party scheduled for Sunday, April 7, has been rescheduled to Saturday, May 18. 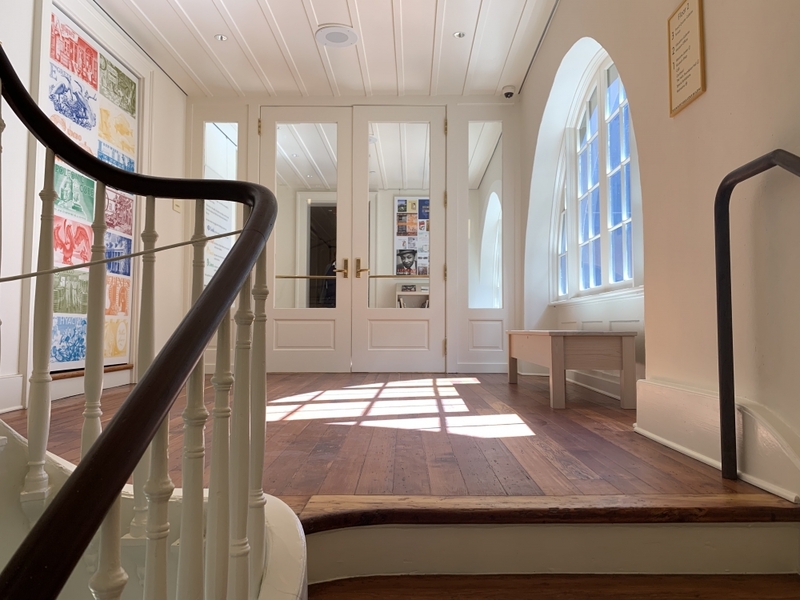 Across the street from THNOC’s original location at 533 Royal Street, the new exhibition center comprises a meticulous restoration of the historic Seignouret-Brulatour Building and courtyard, as well as a brand new, purpose-built rear building. This unique melding of old and new spaces is unlike anything else in the French Quarter. Interpretation Assistant Malinda Blevins details the process of turning THNOC's founder's diary into content for guided tours.